Should a couple that previously lived comfortably in a two-income household divorce, each must make financial adjustments to accommodate for the lost income. Individuals who do not work or earn considerably less than their spouses may qualify for support payments in the form of alimony. Courts do not grant alimony in every divorce case, and your current income plays a significant role in whether or not you are eligible to receive alimony from your ex-husband. Although it isn't uncommon to see women in the workforce or men staying home to raise their children, this was not always the case. When alimony was originally established over 100 years ago, the majority of women did not work outside the home. A woman with little to no work experience or education could face financial devastation after a divorce. Alimony was originally established to soften the financial blow women suffered after divorce by requiring their ex-husbands to continue contributing to their support. Alimony's purpose remains the same today as when it was originally established. Individuals who stay at home and rear children or manage busy households can file a petition with the court requesting support payments. A judge may grant an individual either temporary or permanent alimony, depending on the laws in the couple's state and the circumstances surrounding the case. Alimony laws differ by state but, in general, you cannot receive alimony from your ex-husband if you currently earn more than he does. Alimony's entire purpose is to help the spouse with lower earnings to maintain a reasonable standard of living. If you already enjoy a reasonable standard of living, alimony is not necessary. Because state laws differ, however, this does not guarantee that the judge will deny your alimony request. 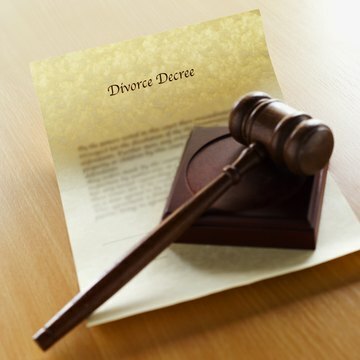 According to North Carolina divorce attorney Mark E. Sullivan, a judge looks at a variety of factors, such as how much each party earns, the standard of living that existed for each individual during the marriage and each party's conduct prior to and during the divorce proceedings when determining whether or not to award alimony. While alimony laws differ by state, judges frequently take financial need into consideration. Thus, your odds of receiving alimony after divorcing are lower if you are financially stable. Not only can earning a higher income than your former spouse bar you from collecting alimony, it can leave you liable for it. A 2009 report by ABC News notes that in the ten-year period spanning from 1998 to 2008, alimony payments by women to their former husbands increased considerably. In 1998, only 7,000 men in America received alimony from their ex-wives. By 2008, that number climbed to 13,000.